Why does financial inclusion matter today? Improve poor families’ overall welfare. What’s the link between financial inclusion and the global development goals? The United Nations Sustainable Development Goals (SDGs) represent the shared aspirations of countries and development actors and go well beyond poverty alleviation. They incorporate the need to promote prosperity and people’s well-being, reduce inequality and protect the environment. While the SDGs do not identify financial inclusion as an independent objective, they acknowledge that it is central to achieving many of them. In fact, financial inclusion is explicitly mentioned in seven of the SDGs, and there are four financial inclusion indicators to track progress. 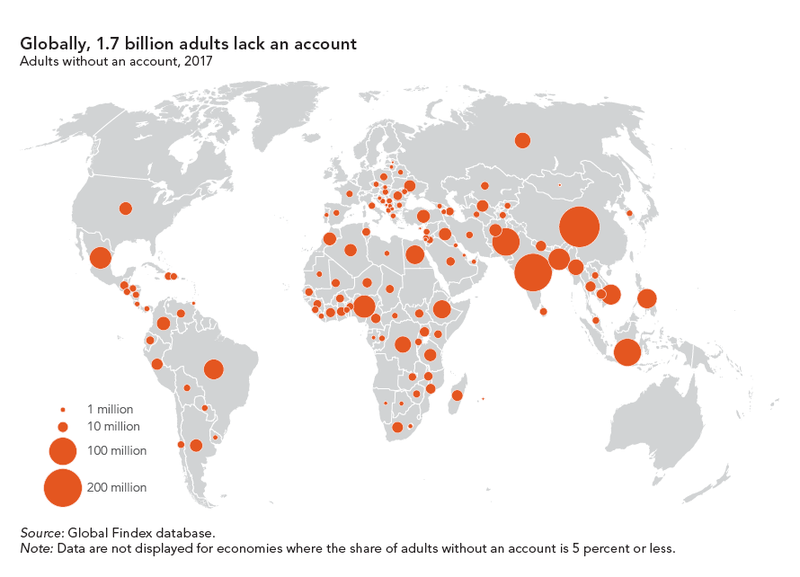 Who are the 1.7 billion unbanked adults globally? Globally, about 1.7 billion adults remain unbanked— without an account at a financial institution or through a mobile money provider, according to the latest Global Findex. In 2014 that number was 2 billion. Because account ownership is nearly universal in high-income economies, virtually all unbanked adults live in developing economies. Women are overrepresented among the world’s unbanked. About 980 million women do not have an account, 56 percent of all unbanked adults globally. Those without an account, men as well as women, tend to be concentrated among poorer households. Unbanked adults are disproportionately young. Globally, 30 percent of unbanked adults are between 15 and 24 years old. Who delivers financial services to the poor? Poor people need many kinds of financial products and services, and a broad and growing range of groups work to reach them with savings, insurance, transfers, payments, and credit services. Traditional providers of such services are banks (state-owned and private), microfinance institutions, credit unions, and cooperatives. Other entities are increasingly using technology to develop new delivery methods to bring these services to the poor in rural or remote areas where traditional banks cannot reach. They include mobile network operators, FinTechs, retail networks, and postal networks. What is CGAP's role in advancing financial inclusion? Creating financial products and services that have value to customers, especially women and other excluded groups. Building sustainable business models that deliver financial services to the poor at scale. Developing the enabling infrastructure to connect people to financial services in a digital world. What role does technology play in financial inclusion? Most poor people in developing countries rely on physical delivery of cash to make payments or access financial services. This can be inconvenient and expensive for customers, who may have to travel hours to reach a bank or financial institution. It can also be expensive for financial service providers, who don’t have the infrastructure to serve customers in remote or rural areas. Mobile financial services provide a pathway to formal financial access in areas that physical banks cannot reach. Although few people in developing countries have access to a bank, many have mobile phones. This opens up a whole new possibility for the unbanked to access mobile money accounts and other text- or app-based financial accounts. Furthermore, having access to the internet through their phones helps some people overcome some of the key barriers to financial access and provision: long distance to a financial institution and high cost of providing services. In addition, rapidly advancing technologies are supporting innovative business models. Big tech platforms are increasingly entering the financial services space through startups, presenting a new opportunity for the unbanked to be financially included in developing countries. What role does government play in financial inclusion? Governments set the rules that regulate the environment for financial inclusion, balancing the drive to bring financial services to poor households with measures to protect consumers as well as the stability and integrity of the financial system. Governments can promote infrastructure, either financially or by incentivizing private sector investments, to support the expansion of financial services. Such infrastructure might include identity systems, connectivity, payment systems or credit registries. Governments can support financial inclusion by determining the routing and volume of payments made government-to-person (e.g., social payments) and person-to-government (e.g. taxes) that favorably shape the financial ecosystem to be more inclusive. Policy makers increasingly recognize that financial exclusion is a risk to political, social, and even financial stability, which may impede economic advancement, and that financial inclusion presents an opportunity to improve lives. The importance is increasingly recognized by many countries who have helped form the Alliance for Financial Inclusion. The G20 through its Global Partnership for Financial Inclusion recognizes its importance, and increasingly the global standard setters consider financial inclusion alongside its other goals of stability, integrity and protection. Who funds the development of financially inclusive markets? A variety of donors support financial inclusion efforts. They include: national governments; private foundations; bilateral donors, such as the United States Agency for International Development (USAID) and the UK Department for International Development (DFID); multilaterals, such as the United Nations and the World Bank; regional banks, such as the African Development Bank and the Asia Development Bank; and development finance institutions (DFIs), such as the International Finance Corporation (IFC) and KfW. Donors also support financial service providers and their innovations through direct investment and technical assistance. CGAP’s annual survey tracking international funding trends showed $37 billion in funder commitments to financial inclusion in 2016, an historic high. What is microfinance and how does it relate to financial inclusion? Microfinance, which has its roots in microcredit, has evolved in recent decades. In the 1970s, social innovators from the Global South introduced the concept that small amounts of short-term capital (microcredit) can help poor people in the informal economy engage in productive activities and grow their way out of poverty. Experience and research revealed the limits of microcredit as an anti-poverty tool. This led to the recognition that poor households need access to a full range of financial services, not only to generate income, but also to build assets, smooth consumption, and manage risks. The term “microfinance” thus has evolved to refer to a broad set of financial services tailored to fit the needs of poor individuals. Financial inclusion has a wider meaning, and it encompasses a wider range of players and institutions. It refers to individuals and businesses having the opportunity to access and the ability to use a diverse range of appropriate financial services that are responsibly and sustainably provided by formal financial institutions. Whereas microfinance advocates generally work with the microfinance institutions that grew out of the microcredit revolution serving the poor, financial inclusion advocates more often work with a broad range of providers to achieve their goals, including those that do not necessarily focus exclusively on poor people. Both the microfinance sector and the global financial inclusion agenda recognize the importance of building consumer financial capabilities and consumer protection policies that account for the conditions and constraints of poor families in the informal economy. Where can I find data on financial inclusion? MIX Market website: Provides data on the financial and social performance of over 2,000 participating microfinance institutions. It includes client outreach measures, simplified financial statements, and a number of standard financial performance indicators. Global Findex: The Global Findex database is the world’s most comprehensive data set on how adults save, borrow, make payments, and manage risk. Launched with funding from the Bill & Melinda Gates Foundation, the database has been published every three years since 2011. The data are collected in partnership with Gallup, Inc., through nationally representative surveys of more than 150,000 adults in over 140 economies. FinScope: A nationally representative survey produced by FinMark Trust that helps explain how individuals manage their financial lives. It also provides insight into attitudes about and perceptions of financial products and services. The sample size varies widely across countries. Financial Inclusion Insights (FII): The FII Program was conceived in 2013 in partnership with the Bill and Melinda Gates Foundation to build meaningful knowledge about the financial landscape in eight countries across Africa and Asia. Through qualitative and quantitative research FII provides demand-side insights into consumer’s financial behaviors, and identify pathways so those most in need have the financial tools necessary to improve their economic stability. GSMA Mobile Money Adoption Survey: The Global Adoption Survey of Mobile Financial Services is an annual survey conducted by the Mobile Money Programme which captures quantitative information about the performance of mobile financial services. For more information on data sources, see Measuring Market Development Handbook (Pages 56-57 and APPENDIX M6-A). What is the impact of financial inclusion? It unfolds through three intertwining pathways. First, financial inclusion can contribute to poverty alleviation by bringing financial products and services within reach of people living in poverty. For example, households without access to other forms of a social safety net may obtain credit, insurance, use a savings account or receive money from relatives via payment services, which help them better manage financial shortfalls and emergencies, thereby building resilience. Second, it can contribute to poverty reduction – that is, bring people out of poverty on a sustained basis when they can use financial services that help them to grow their businesses and invest in education. Research in Kenya estimates that M-Pesa helped lift almost 200,000 people out of extreme poverty. Finally, it may contribute to economic activity and eventually economic growth, although this link is less well established and requires further research. The benefits of financial inclusion extend beyond individuals and households. Shifting cash payments to digital delivery -- whether it is social welfare transfers made by governments to citizens; or people paying their taxes, fees and bills to governments; or payments made between people - can improve their efficiency and reduce the amount of money lost to corruption. Digital payments can also provide the backbone for new types of delivery for basic services, such as solar energy and water particularly to remote areas where national grids are too expensive. Digital payments also support education delivery. As such, global leaders are increasingly recognizing the role that financial inclusion can play in helping the world achieve many of the Sustainable Development Goals. Researchers are continuing their work to identify the ways that financial inclusion affects the lives of poor people, including the potential for negative impacts such as abusive lending from lack of transparency and overly burdensome debt loads, and ways to limit and manage those risks.